John Hoyer Updike (March 18, 1932 – January 27, 2009) was an American novelist, poet, short-story writer, art critic, and literary critic. 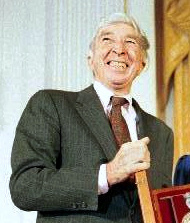 One of only three writers to win the Pulitzer Prize for Fiction more than once (the others being Booth Tarkington and William Faulkner), Updike published more than twenty novels, more than a dozen short-story collections, as well as poetry, art and literary criticism and children's books during his career. My grandmother would sometimes choke on her food, and have to go out on the side porch in Shillington, where one or another member of the family would follow and hammer on her back while she clung, gagging, to the porch rail. . . . I also would choke now and then. My album of sore moments includes a memory of crouching above my tray in the Lowell House dining hall at Harvard, miserably retching at something in my throat that would not go up or down, while half-swallowed milk dribbled from my mouth and the other students at the table silently took up their trays and moved away. On the edge of asphyxia, I sympathized with them and wished that I, too, could shun me. The world keeps ending but new people too dumb to know it keep showing up as if the fun's just started. Adversity in immunological doses has its uses; more than that crushes. When we try in good faith to believe in materialism, in the exclusive reality of the physical, we are asking our selves to step aside; we are disavowing the very realm where we exist and where all things precious are kept — the realm of emotion and conscience; of memory and intention and sensation. In asking forgiveness of women for our mythologizing of their bodies, for being unreal about them, we can only appeal to their own sexuality, which is different but not basically different, perhaps, from our own. For women, too, there seems to be that tangle of supplication and possessiveness, that descent towards infantile undifferentiation, that omnipotent helplessness, that merger with the cosmic mother-warmth, that flushed pulse-quickened leap into overestimation, projection, general mix-up. Being human cannot be borne alone. We need other presences. We need soft night noises — a mother speaking downstairs.
. . . We need the little clicks and sighs of a sustaining otherness. We need the gods.